MWM NEWS BLOG: Featured. Vormator Book. Vormator: The Elements of Design is a new concept-book published by Zeptonn & Booreiland. 80 designers were asked to create artworks using the same 8 simple shapes. No other elements were allowed, and the results are really amazing. The book is a hardcover 192-pages of designs and commentary from each participant. 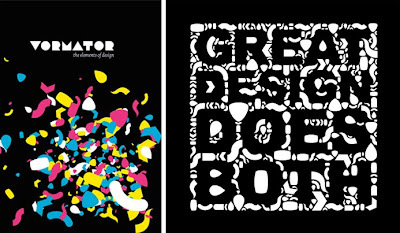 My "Great Design Does Both" is pictured above, a witty attempt at showing how design can "look good" and "get the message across". Order Vormator Book.